Soak the chickpeas overnight or at the least for 8 hours. Pressure cook chickpeas with enough water till soft and set it aside. Then add tomato, ginger, garlic and sauté till cooked well. Allow it to cool and then pour it into a mixer. Grind it all into a fine paste and set it aside. Heat oil in a big vessel, add the chopped onions and cook till they turn translucent. Add the ground tomato paste. Add all the spice powders and mix in well. 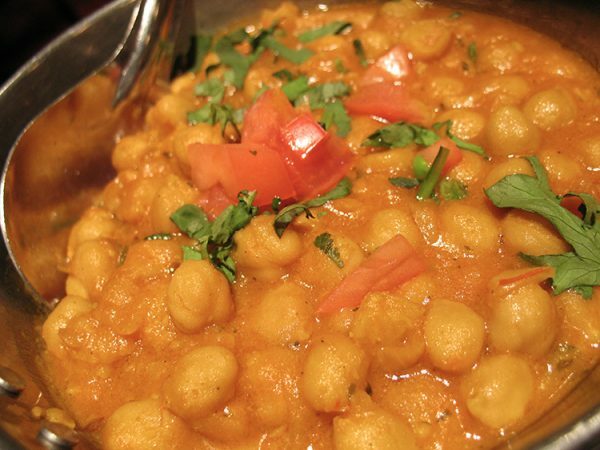 Once the raw smell of the masalas (spice mix) leaves, add the chickpeas along with the cooked water to this mixture and cover and cook on a medium flame. Add salt as required and taste to check. Once cooked through, open lid and add more water if the gravy is too thick. Once oil separates and desired consistency is reached, garnish with coriander leaves and take off the heat. Serve with choice of: poori or chapati and/or rice. If grinding is not possible for large quantities, simply add chopped tomatoes and ginger garlic paste separately.